The Maori settlement of Te Moana-a-Toi, on New Zealand’s North Island, was given its European name of the Bay of Plenty by Captain James Cook, who while sailing past in 1769 noted the conspicuous fertility of the region’s soil. Among the produce that grows amazingly well here is the kiwi fruit - around 80% of New Zealand’s annual kiwi crop originates from orchards in the Bay of Plenty, but note that it is actually the shy, flightless bird hiding away in the bush from which New Zealanders derive their affectionate nickname. First settled in the 13th century by Maori tribes, the Bay of Plenty is a magnificent expanse of coastline stretching in a curve from Cape Coromandel in the northwest down to Cape Runaway over nearly 200 miles. 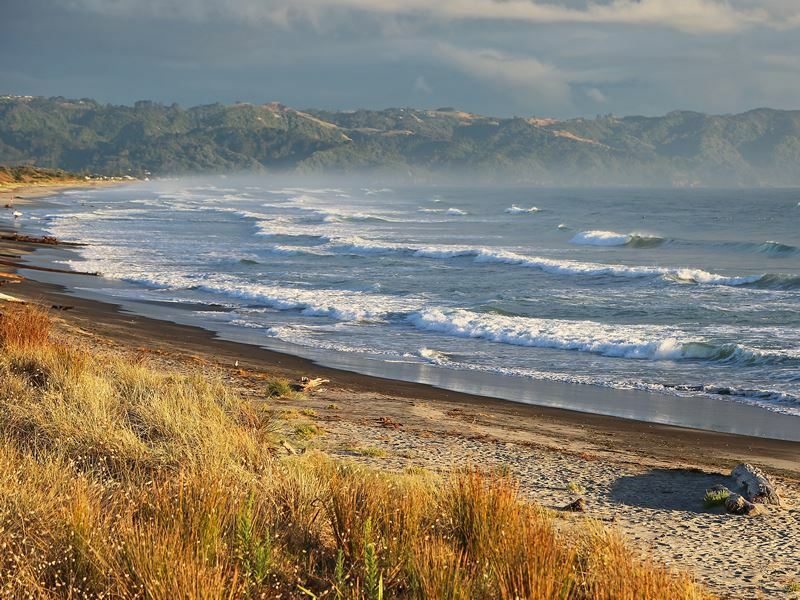 A stay in the bay promises endless silvery strands of beach, watersports galore, and also plenty of fascinating history - the Maori population here remains among the largest in the country, and this area bears the traces of many ancient settlements, as well as significant battle sites. 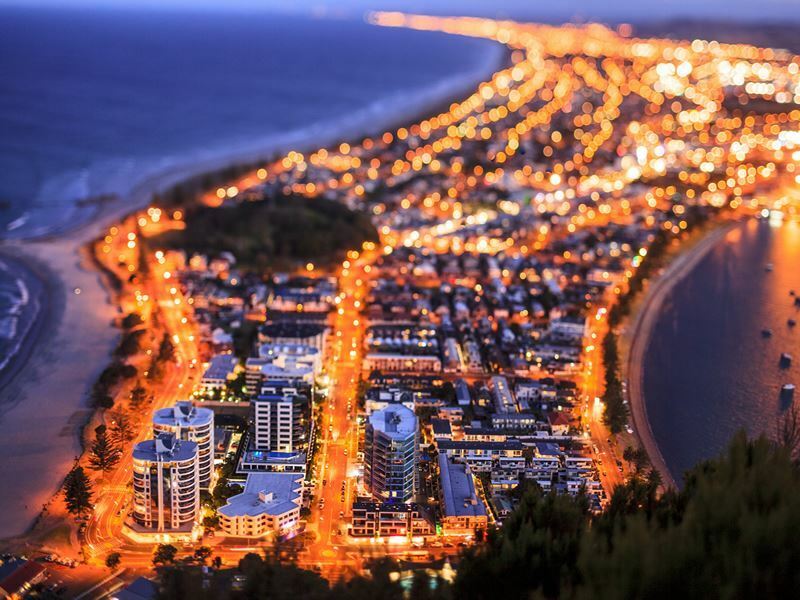 The biggest city in the region, Tauranga, offers quick flights to other urban centres across New Zealand, while Auckland is only a three-hour journey north by road. This is a premier destination on the North Island for coastal getaways - during the summer months the population swells like a ripening kiwi on the vine - while just inland there is the spectacular lake district to explore, most notably the geothermal town of Rotorua. With a picturesque waterfront setting and its proximity to many farms and orchards, Tauranga is New Zealand’s second busiest port. Cruise ships and fishing boats crowd the harbour, the entrance of which is guarded by Mauao, an extinct volcanic cone, and a statue of Tangaroa, Maori god of the sea. The Strand area downtown is lined with cosmopolitan bars, restaurants and cafes, while much of the daytime activity is naturally centred on water-based pursuits, from sailing and fishing trips, to dolphin-watching tours and diving offshore reefs and islands. This rural township is surrounded with kiwi and avocado orchards, where visitors can take fragrant guided tours before picking up some fresh produce to take away. Katikati has a bohemian, creative ambience - walls are decorated with murals, and a local artist has carved Japanese haikus into huge river rocks. Maps are available to follow some unique town trails, around these landmarks, and just outside of town there are some pleasant bird gardens to wander through. Te Puke (the hill) is another peaceful farming community that is worth a visit if only to see the immense fibreglass statue of a kiwi fruit on the outskirts of town, which makes for a unique photo opportunity. You can actually climb to the top on an internal stairway, and gaze out across a patchwork quilt of orchards and dairy farms. 15 mins from Tauranga by car, this laidback resort town is known by locals as ‘the Mount’. The town’s main beach is reckoned to be among the most beautiful in the South Pacific (it’s actually called Main Beach - come on New Zealand, your place names are usually amazing, you can improve on this). 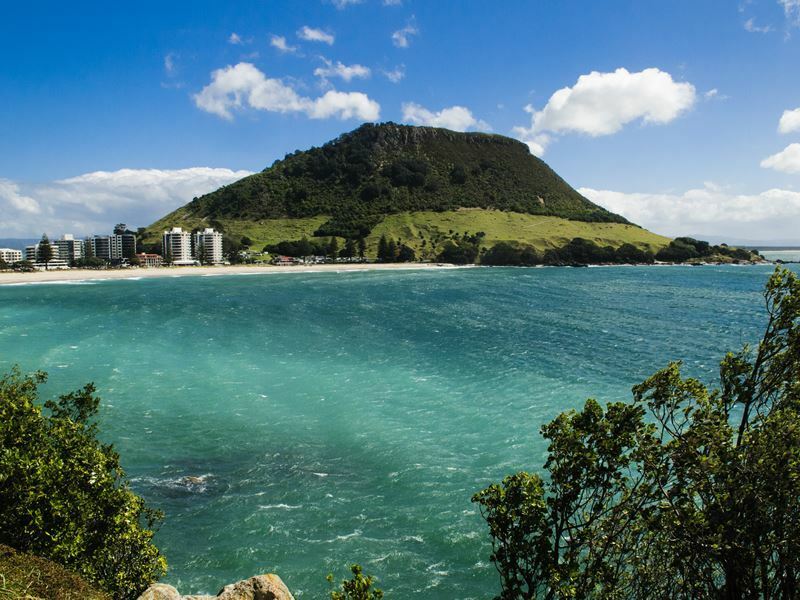 For a spot of exercise, walks around the base of Mount Maunganui (Mauao) are very popular. You can also climb to the summit for some extraordinary panoramas. 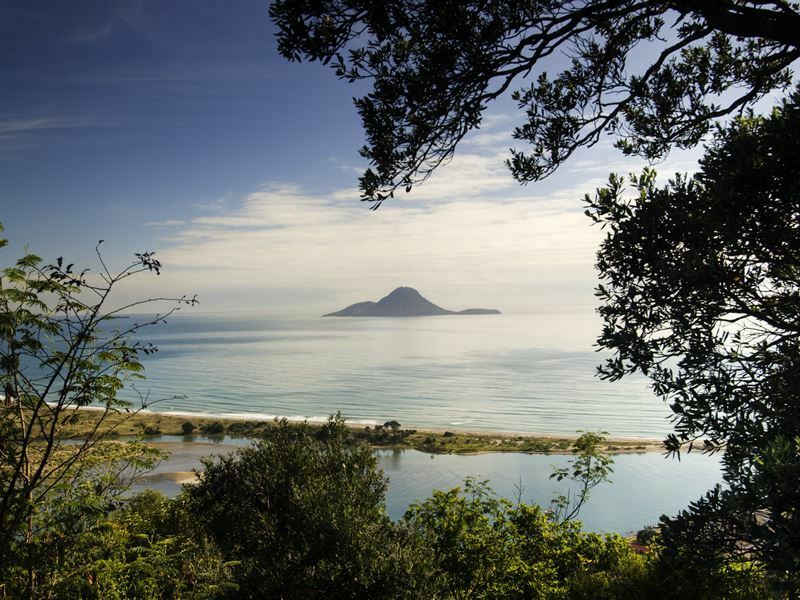 Whakatane is officially New Zealand’s sunniest and warmest town, a paradise for sport fishing, and the gateway to the iconic White Island, the country’s only active marine volcano. Just out of town, Ohiwa Harbour is another excellent birding spot, with a lovely beach that has a solid reputation among the local surf community. 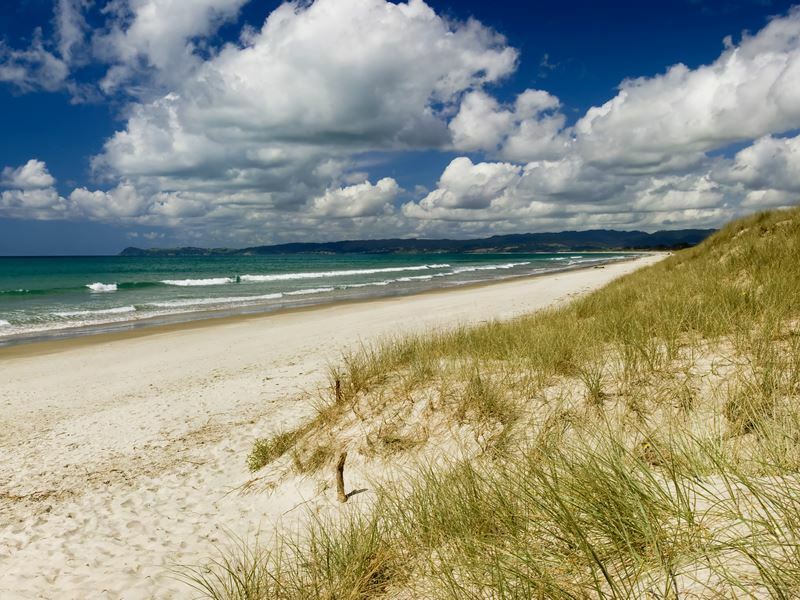 A charming coastal town just 40 minutes’ drive north of Tauranga, Waihi Beach gets very busy during the summer. The white sands are dotted with bachs, traditional New Zealand holiday homes, while the calm waters are ideal for families. Nearby, the Orokawa Scenic Reserve is criss-crossed with walking trails that offer beach and bush views. An hour inland from Tauranga, Rotorua is the jewel in the crown of New Zealand’s lake district. The landscape has been shaped by geothermal activity for millennia, making it a hotspot, literally, for bathing in mineral spas. 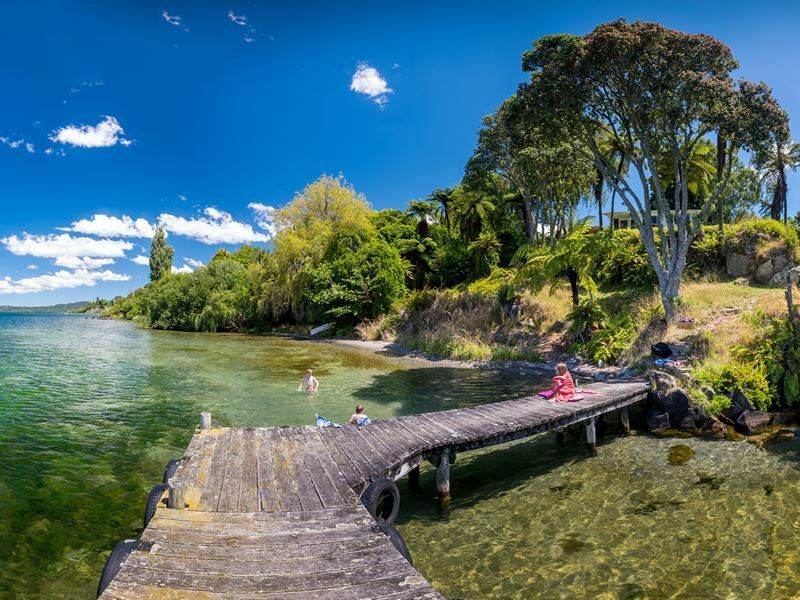 There is a vast range of activities available in and around the town, from Maori cultural visits to whitewater rafting on the Kaituna river, and Rotorua also has a similar breadth of accommodation options including luxury hotels by the lakeside, or secluded retreats among the treetops. Many visitors will use Rotorua as their base for convenient coastal day-trips around the Bay of Plenty region, or spend most of their time on the coast and enjoy a day or two in Rotorua - either works well on a North Island holiday, but this is certainly a place not to be missed. The Maori name for New Zealand is Aotearoa - land of the long white cloud. Arriving in canoes from ancient Polynesia around 1280 AD, the Maori people built settlements across both islands. After the Treaty of Waitangi in 1840, sovereignty was ceded to the British Crown, but sporadic battles followed between tribes and settlers. One notable skirmish, the Battle of Gate Pa, is commemorated at the Elms Mission House in Tauranga. You can also see the Mataatua Wharenui, an elaborately carved Maori ancestral house, in Whakatane, and enjoy a wide range of amazing cultural activities at the famous Tamaki Maori Village in Rotorua, including a traditional haka ritual and a ceremonial feast. Most of the main public beaches in the Bay of Plenty have lifeguards, but be wary of strong surf and currents. If you’re familiar with James Bond movies, you may remember when the world’s greatest spy took flight in a gyroplane during ‘You Only Live Twice’. Think of it as a cross between a slow-moving motorbike and a mini-helicopter, and you’re on the right lines. Tauranga is one of the only places in New Zealand where you can take a ride or a lesson in these unusual flying machines. The gyrocopters have an open cockpit, allowing for uninterrupted views and the incredible sensation of wind on your face as you sail through the sky. Meanwhile, in Mount Maunganui, the Classic Flyers Museum features a substantial collection of vintage aircraft including Spitfire and Skyhawk as it celebrates New Zealand’s proud aviation heritage. There’s no getting around the fact that Rotorua is a little on the smelly side. Because of all the thermal activity in the area, a lot of hydrogen sulphide is released into the air, giving the town a distinctive aroma of rotten eggs and earning it the nickname ‘Sulphur City’. The good news, of course, is that this same thermal activity has resulted in many bubbling hot mud pools, that are mineral-rich and fantastic for your skin and soothing various ailments. Most well-known is the Hells Gate Geothermal Park, where you can cover yourself in the warm grey mud then wash it off under a spring-fed waterfall, before indulging in a range of treatments and massages. The Easter Jazz Festival held in Tauranga is the biggest of its kind in New Zealand and one of the North Island’s most popular music events. Stacks of local and international acts perform over a five-day roster that also encompasses soul, swing and Blues. If you’re planning a New Zealand holiday around Easter, this could be a highlight of your stay. The White Island, known in the Maori language as Te Puia o Whakaari (the dramatic volcano) is actually the tip of an underwater cone volcano, the majority of which is below the surface. It has been gently smouldering and smoking for centuries, with infrequent lava flows and eruptions. Those with a sense of adventure can take a boat tour out to the island, and actually enter the inner crater directly from the beach. You’ll experience an otherworldly atmosphere, as you pass fuming vents, bubbling mud pools, streams of lava and even a lake of acid, learning about the geothermal activity here and attempts to mine sulphur. Some tours include the option to swim off the island, and spot dolphin and whale along the way. You’ll be equipped with hard hat and gas mask(!) and the most common departure point is Whakatane. While the Bay of Plenty is renowned for its beautiful beaches, inland there are many superb walking trails through diverse scenery. 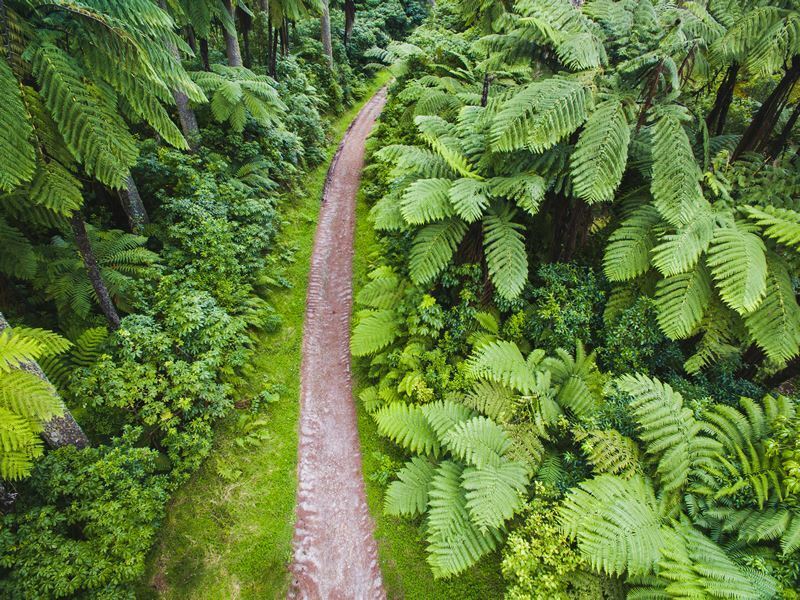 The Kaimai Mamaku Forest Park, between Waihi and Rotorua, was a rich source of food and medicinal plants for Maori tribes in years gone by. Tracks here take you past tumbling waterfalls, rocky gorges and immense kauri trees. The Papamoa Hills Regional Park, near Te Puke, offers landscape composed of rolling plains, pine forest and bush, as well as thrilling coastal views. You can see the remains of several ancient Maori Pa, fortified settlements, in this area. There are no end of watersports to be enjoyed in the Bay of Plenty, and if that’s your thing then Tauranga is a good place to base yourself. You might join an organised boat tour to see whale, dolphin and seal off the coast, or try some kayaking, such as on Lake McLaren, where you can paddle through a steep-walled canyon that has an almost prehistoric vibe to it, or explore a glow worm cave. 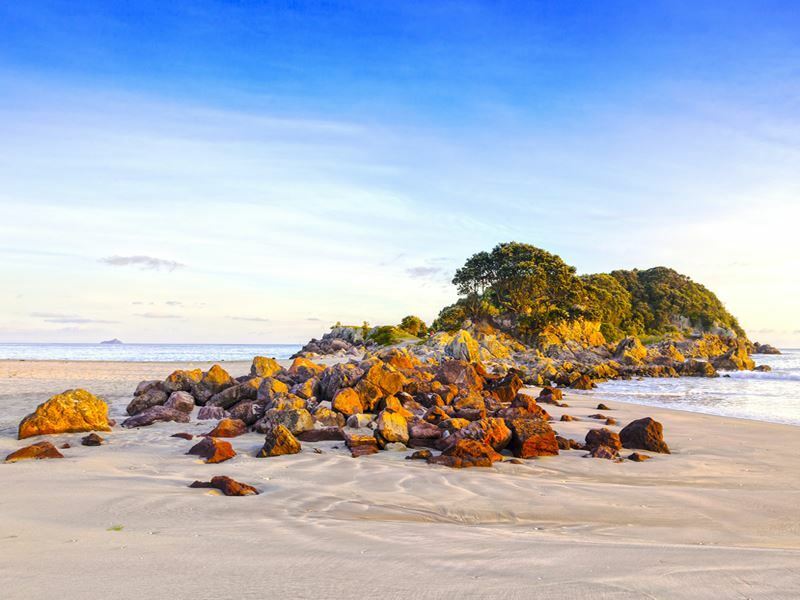 Whale Island, a few miles across the sea from Whakatane, is a wildlife sanctuary, where you’ll encounter blue penguin, fur seal and if you’re lucky, the occasional kiwi, before digging your own hot pool in the sand.